When rainwater runs off the land and enters a storm drain, it often empties into a nearby body of water and remains untreated. This poses a problem because increased urbanization in Dane County is creating more runoff. Many surfaces in urban areas are either impervious or absorb very little water, like roads and traditional lawns. Before heavy development, natural land absorbed 80-100% of rainwater. Currently, in urbanized areas, anywhere from 40-100% of water does not get absorbed. All of the leftover water flows over the land to the nearest drain, picking up pollutants and sediment along the way. Since the stormwater drains to local lakes and streams, so do the contaminants. Nutrients in the runoff, like phosphorus, can cause massive algae blooms that wreak havoc on our natural bodies of water. 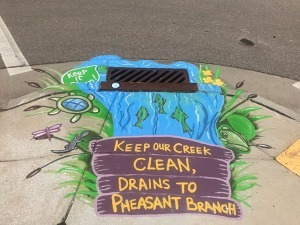 The Storm Drain Mural Project aims to bring awareness to this issue and motivate residents to take action to reduce pollution to our lakes and streams through art. Students from various schools first learn about stormwater runoff and prevention, then submit drawings and mottos for storm drain murals. The designs are collected by local artists and transformed into murals to be painted on drains around Dane County. The murals include information on the name of the waterbody the stormwater drains to along with a website where residents can learn about simple actions they can take to keep our waters clean. Visit www.ripple-effects.com to find an interactive map showing the storm drain mural locations and to learn about simple actions you can take to protect our waters!